Home 30thMay Biafra IPOB Nnamdi Kanu Ohanaeze Biafra: The Desperation Of John Nnia Nwodo, His Fellow Murderers And The Future Of IGBO Youths. Biafra: The Desperation Of John Nnia Nwodo, His Fellow Murderers And The Future Of IGBO Youths. This combined team of useless errand boys of Hausa-Fulani caliphate was so mad that they went to the extent of desecrating anything that we hold prestigious in our land. These Nnia Nwodo contracted killers and janjaweed combined team of useless errand boys in military and paramilitary regalia went the length of hitting our mothers with very heavy sticks. They pushed our mothers who went up to the event venue to register their opinions on the issue of restructuring to the ground. I saw also how with impunity they talked at our mothers who tried to gain entrance. It was a searching spree on a people with no recorded acts of crime or violence in the face of a people who should serve to preserve what is left of us as sacred or no go area. Our Youths were mowed down in their numbers, so many left with injured limbs, so many sustained degrees of injuries at various parts of their body, so many broken heads - like Agbo Moses of family writers was also one among many with broken heads! Our people who attempted gaining entrance into the event venue in the Alex Ekwueme square were humiliated like nonentities, simply because Mazi John Nnia Nwodo and his bandwagons have a raging desperation to mortgage the last of IGBO sons standing until every of their demonic and materialistic essences are met in surplus. The way and manner these military errand boys displayed their denigration of our people at the venue of the OHANAEZE NDI-IGBO disgraceful summit only goes to show nothing other than the singular fact that they had got a strong backing of the OHANAEZE DE FACTO body, the janjaweed club of political wastes so-called elites and of course the bloodsucker himself called 'Hausa-Fulani Cabals' in Aso-Rock, the sit of mediocrity and theatrical comic center in Abuja. Why it was important to demand an array of such military presence at the event venue, an event that supposedly was designed to declare the interest of NDI-IGBO in the political configuration of Nigeria, in Igbo land and supposedly for Igbo people at large, is one heavy anomaly too elusive for even the most discerning minds to decipher. It indeed calls for worries as there is evidently not an existing political imbroglio at the moment in the entire geopolitical territory of the southeast, in the current arrangement, that should warrant the necessity. The saying that 'an evil man runs when no one chases him' is the most articulate summary to what John Nnia Nwodo, the criminal president general of OHANAEZE NDI-IGBO displayed during the summit-gone bad. I have seen a man who says to be representing a people but is persistently scared of the same people he is said to be protecting. 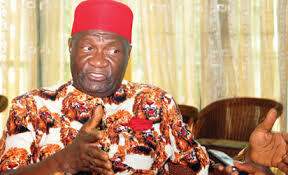 The views of the Nnia NWODO led OHANAEZE and the rest of the IGBO people are diametrically in sharp opposition. Why Nnia Nwodo and his bandwagon of janjaweed elites so to say have chosen to impose an alien ideology upon the larger IGBO population is an archetype of madness that can only be obtained in black Africa, where opinions of a few, not the people count. Nnia Nwodo unlike his paymasters, the Hausa-Fulani caliphate, does not understand the game of self-preservation in a vicious political configuration as Nigeria. Nnia Nwodo and his fellow money-bags were quick to summon the conference last year 2017, whereon they proscribed their own kits and kin. The supposed leaders of tomorrow at the expense of the perplexed international observers. The degree of shame the masquerades we have at the frontiers of power across the length and breadth of the southeast have brought us is too much for a people like us, acclaimed the most intelligent black race in the World. The level of low Nnia Nwodo has bargained with his paymasters to bring us under will be too difficult to reverse if nothing is done to quickly wind back the springing idiocy. We have a unique history as a people, which anyone who cares about us truly, should work well to preserve and uplift. All Nnia Nwodo and his fellow scammers have ended up doing is the game of the more you look the less you see. Nnia Nwodo has no qualms at all, judging from his antecedents so far as the leader of the de facto octogenarian gang called OHANAEZE NDI-IGBO. What becomes of the next generation of Ndi-Igbo if the litany of traumatic and psychological damage Nnia Nwodo and his gang of criminals and political merchants are depositing in the IGBO youths currently is not properly halted will need a heavier exorcism to wipe up. The style and merchandise political dispositions of the de facto criminal gang called OHANAEZE Ndi-Igbo has No bigger low! If we had an opportunity to crawl, they are bringing it down to less! The game remains to please the caliphate at the expense of the Great IGBO people. I was thinking if collectively denying our IGBONESS for Nnia Nwodo and his fellow scammers to have their way would serve them better and save us all the insult of the GREAT IGBO in the nomenclature'Ohanaeze Ndi-Igbo' though, a second thought got me thinking otherwise! No one person can cook for the general public satisfactorily and No one person can finish completely anything jointly prepared by the general public. We must rise continually against the Nnia Nwodo sustained impunity against us until there is no left vestige of remembrance of their disservice across the length and breadth of our land anymore. OHANAEZE Ndi-Igbo has for decades remained an irredeemable franchise for the sharpest criminals in IGBO land of Biafra. Nnia Nwodo added more fire to the money making posture of the de facto body. The coming of Biafra as consistently clamored for by the people is sacrosanct and something which no one can change from now until Biafra is restored a sovereignty in this very face of the planet Earth. Biafra is a must and nothing anyone does can deter the restoration of the lost dignity of Biafra. Long live Biafra, long live Mazi Nnamdi Kanu, long live human rights activism Worldwide! All concerned global rights body must awake and live up to responsibilities. Biafra is sacrosanct! 30th May is Biafra's Heroes day!